A seminar assessing the use of sprinklers in protecting the elderly and vulnerable from fires in residential care premises and specialised housing is being held at the Brigade's headquarters today. 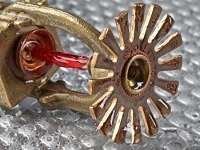 Over a hundred participants from the Brigade and the British Automatic Fire Sprinkler Association(opens in a new window) will discuss how sprinklers can save lives and their effectiveness in helping to prevent fire fatalities. There is clear evidence that sprinklers can be effective in suppressing fires quickly. According to our figures, there are around ten fires in London's care homes every week, which is why the Brigade is campaigning to promote the benefits of installing sprinklers in buildings which house some of the capital’s most vulnerable people such as care homes and sheltered accommodation. In Scotland there is already a requirement within building standards for all new build residential care buildings to have automatic fire suppression systems installed, the Brigade is calling for the same level of protection in London.